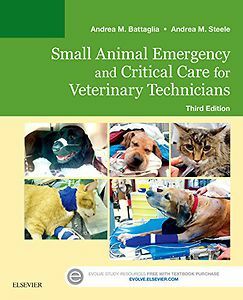 Master the veterinary technician's role in caring for pets requiring emergency and critical care!Small Animal Emergency and Critical Care for Veterinary Technicians, 3rd Edition provides quick access to dozens of common, life-saving protocols and procedures. Each treatment technique is described in step-by-step detail and illustrated in full color. To prepare you for the veterinary practice setting, a team approach is emphasized. This edition adds even more value with two new chapters and easy-to-apply medical math and scenario-based exercises. Written by experienced veterinary technicians Andrea Battaglia and Andrea Steele, this practical resource prepares you for success in animal hospital emergency departments and veterinary practices!